Every year we look back to see what topics resonated with you, our dear readers. I know, no fair to the most recently published posts, but this ain't the Oscars. Scanning the list shows we all had change on our minds this past year—impending internal change as well as the convergence of competing companies. So, in case you missed them, here's a roll call. What’s the Particular Significance of Community Brands’ Acquisition of Nimble? While we're at it, how about a few highlights from our year here at DelCor? The ASAE Foundation published the Tech Success Study, sponsored by DelCor and based on our IT Maturity Model. Loretta was feted at the Association TRENDS Salute to Excellence and Brian was named a top IT executive. We co-sponsored Association Palooza V on a very hot topic (as noted above): digital transformation. Our 15th annual .org Community Food Drive raised more than $25,000 for those at risk of hunger in our region. We hired our 50th employee (and then some) and opened a second office in Chicago. Our writers translated tech jargon related to project management and AMSes to empower you. DelCorians earned credentials in agile project management, ethical hacking, and more. 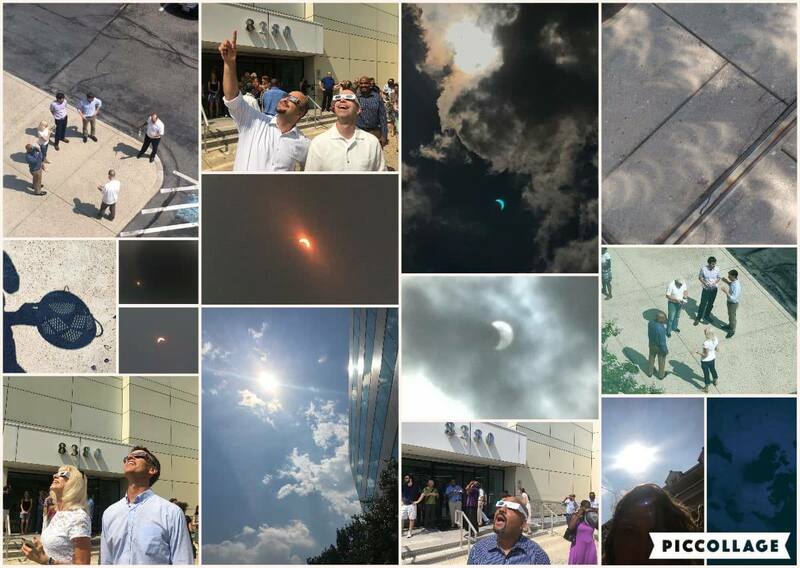 DelCorians observe the solar eclipse at HQ and all around the region.